Despite the fact that two whole afternoons were devoted to rooting the Cubs to victory, we still had plenty of time to get some great sight seeing in. On Friday after the game, we headed up Michigan Avenue to do a boat tour. I highly recommend this to anyone that has the chance because it's definitely worth it. Like I said to Andrew, for all we knew everything the tour guide was completely made up, but it sounded good if nothing else. They keep the information pretty general and light so your brain doesn't hurt after the hour and some change is over. It also gives you a great opportunity to a) see things you wouldn't otherwise see and b) learn some fun facts! 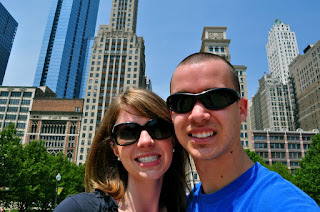 Our last full day, Saturday, could not have been more perfect for sightseeing via the streets of the Windy City. And I honestly think we walked a total of 5 or 6 miles, which I'm not complaining about because have I mentioned how much I ate? And I assure you, I looked so hot in my sundress and sneakers. Yes, I wore my running shoes for this part of the endeavor. It was either that or flip flops and I know Andrew would not have wanted to hear me complain for all those miles about how my feet/back/etc hurt. "Chicago is a combination of mistakes and miracles." I loved that because clearly those words can apply to more than just a city. Our lives, each and everyday, are made up of near misses and blessings. I have searched thoroughly, in a myriad of ways on Google trying to find the rest of this quotes, but had no luck. This should conclude my recaps of Chicago, but no promises! Please feel free to pass on any tips about the next time we go back...because we will be returning.